Happy summer and Fourth of July! This salad is perfect for your picnics, parties or summer dinners. It is very colorful and when served ice cold, very refreshing. Mix all ingredients in a bowl and chill well before serving. 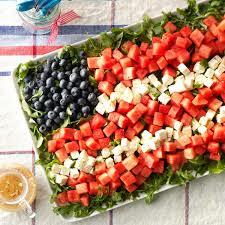 For a creative display, salad can be made into the shape of a flag before mixing!